Rathore, Karmakar in with a good chance to replace under-performing shooters. 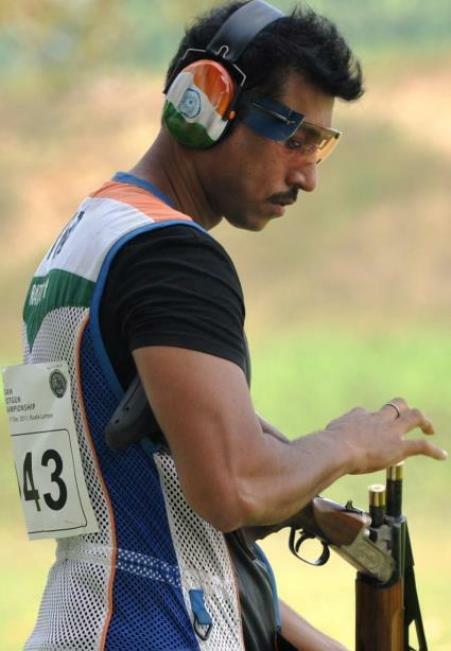 Athens Olympic Games silver-medallist Rajyavardhan Rathore would be itching to have a go at the Dr Karni Singh Ranges when the Shotgun National Championships kick off two days from now. And uppermost on the double-trap shooter’s mind would be securing a London Olympic Games ticket by shooting high scores. With the National Rifle Association of India making it clear that only the most deserving marksmen — backed by good scores — would be allowed to go for the quadrennial mega sporting event, Rathore has started fancying his chances. Rathore has been in great form since November last year when he shot a dream score of 148/150 to equal the world record at the inaugural Asian Shotgun Championships in Kuala Lumpur and narrowly missed out on the Olympic quota at the Asian Championship, which concluded recently in Doha. National coach Sunny Thomas also hinted that the Army shooter had a bright chance of making the cut for the Olympics. Weather conditions, said Thomas, spoiled Rathore’s show in Doha, but with the climate in Delhi at this time of the year quite pleasant and conducive to shooting the Athens silver-medallist could well replicate his Kuala Lumpur feat. “Since Rathore is enjoying a good run, he should be impressive in the National Championships and the two trials,” felt Thomas. The coach said that since there was a provision to exchange quota place (earned by some other marksman not performing at his best at the moment), a lot of things could happen at the Nationals and the two trials. So far, India has won 11 quota places. Under the International Shooting Sports Federation rules, a country can exchange one quota place with another event, depending on the vacancy in the desired event. The deadline for exchanging the quota and sending the final team entry list is March 12. Perhaps, this quota exchange rule could help Rathore make it to the Olympic team. Thomas agreed that some of the shooters, who won quotas, have not been shooting scores of Olympic standards. “We do not want to send someone to London who is not capable of winning a medal. Many things will have to be taken into consideration before selecting the team. We want to study the scores of the previous Olympics in each event and compare them with the scores of our quota winners before finalising the team,” said Thomas. For now, Abhinav Bindra, Gagan Narang, Ronjan Sodhi, Manavjit Singh Sandhu, Sanjeev Rajput, Vijay Kumar, Annu Raj Singh and Shagun Chowdhary are as good as part of the team because of their superb performances till now. The two events, where there has been inconsistency in scores, are the Men’s 50m rifle three-position and Women’s 25m sports pistol. In sports pistol, Anisa Sayeed and Rahi Sarnobat have both shown they can shoot good scores at the highest level, so retaining a quota between them would be fair enough. In all likelihood, the quota that is likely to be surrendered is for men’s 50m three-position, where India has reserved two slots. Gagan is a triple starter in the rifle events on the basis of his quota in 10m air rifle and Minimum Qualification Scores in the other two rifle events. So, even if one quota in men’s three-position is surrendered, Gagan will still play in the event along with Sanjeev Rajput. As per NRAI’s Olympic rankings, Gagan is ranked much higher than Imran Hasan Khan, and even if the quota is not surrendered, it will be Gagan and not Imran shooting in three-position. In these circumstances, the ideal choice for exchanging the quota will be for men’s double trap in order to accommodate Rathore, as he is a proven material and is in superb form, capable of a podium finish in London. In men’s rifle prone, as per the selection policy, Hariom Singh will face the axe as he has not been in the best of form ever since he won the quota place at the World Championships in Munich in 2010. The shooter, who could come in his place is Joydeep Karmaker, who is ranked on top, ahead of Sushil Ghaley. Karmakar also has the potential to shoot a high score in big competitions. He has won a World Cup silver with a score of 599. With the selectors hinting that they would take advantage of the ISSF’s quota-exchange option, some tough decision could be in the offing. This is the first time the NRAI would be doing such a thing, so they should be doubly sure before axing someone. Top five scores of World Championships, the last four World Cups, Asian Championships and last two National Championships were taken into account for rifle and pistol shooters. The selectors will have to make a tough choice between Anisa Sayeed and Rahi Sarnobat as both are running each other close. But, as per the top qualification scores, it looks like Anisa will make the cut.